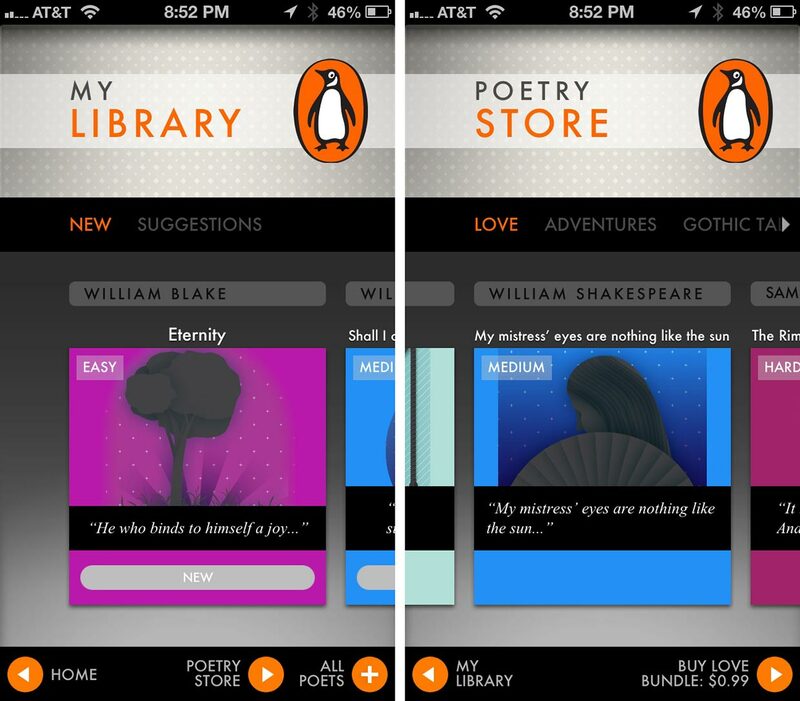 Poems By Heart from Penguin Classics is an iPhone and iPad app that combines great poetry, memory skills, and gaming into one beautiful app. In this game, you must memorize classic poems in stages and ultimately learn them in their entirety. Poems By Heart includes classics by Shakespeare, Edgar Allan Poe, Emily Dickinson, and more. Poems By Heart includes two poems for free: Eternity by William Blake and Shall I compare thee to a summer's day? by William Shakespeare. 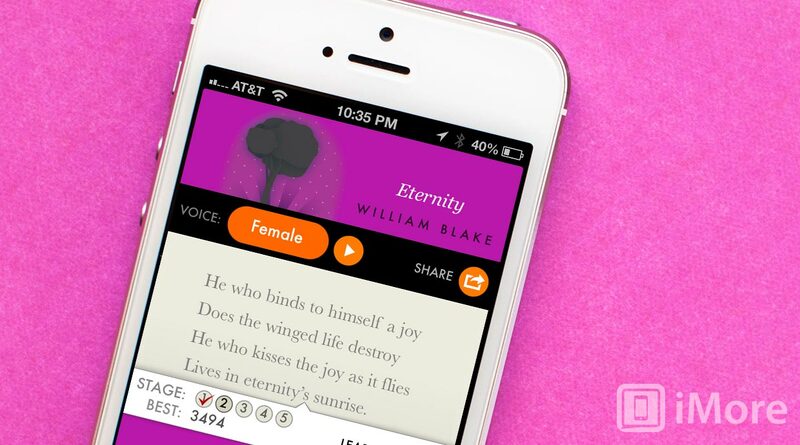 When you select a poem, you can choose to have a male or female voice read it to you. Listening to it recited will help you memorize and you can follow along the highlighted lines of text at the same time. After listening to it, it's your turn. But instead of being immediately tested on your ability to regurgitate the entire poem, you get to tackle it in stages. In stage one, you will need to fill in one or two blanks per line by selecting the correct words. Each stage introduces more blanks until the final stage where you must fill in every word. You are also timed for each line and given a score based on accuracy and speed. In the Poetry Store, you can purchase packs of four poems for $0.99 each. The categories available are love, adventures, gothic tales, early inventors, romantic, Elizabethan, and odes. 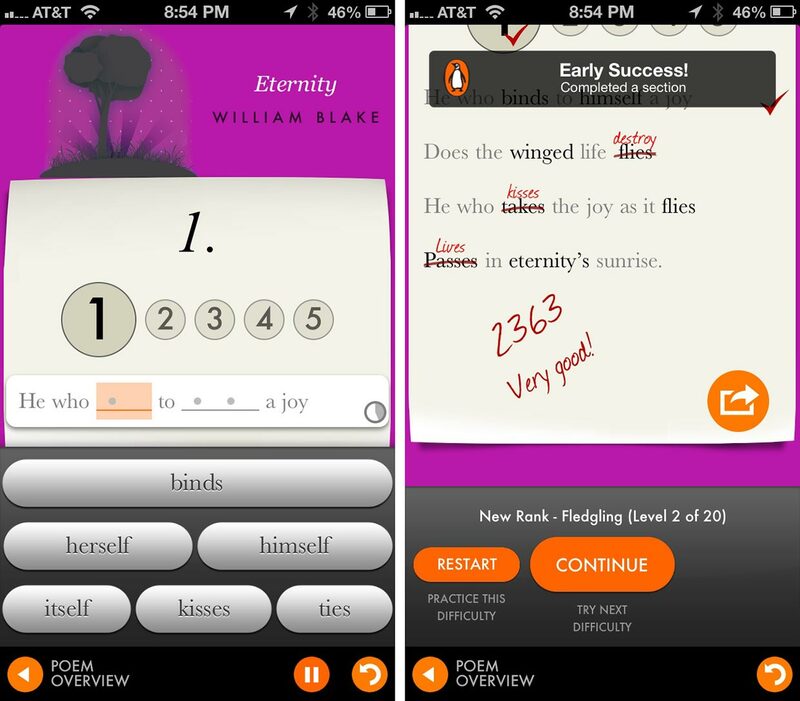 If you're a poetry fan and enjoy memory games, Poems By Heart will make a great addition to your app collection.